You may have played quite a few logic puzzle games. One of the classic games of this kind is Tetris. Cut Block Puzzle is similar in that it requires you to think logically when place a number in a grid. First step in Problem Solving is to understand the problem, which means, you need to know the rules(process), the input you can have and the expected outcomes(output). There are two rules that must hold of a completed cut block puzzle. Each area marked out by darker lines must contain the numbers from 1 up to the number of squares in the area. For example, the top most area in the first puzzle below consists of 5 squares so those squares must be filled with the numbers: 1, 2, 3, 4 and 5 with no repeated numbers. 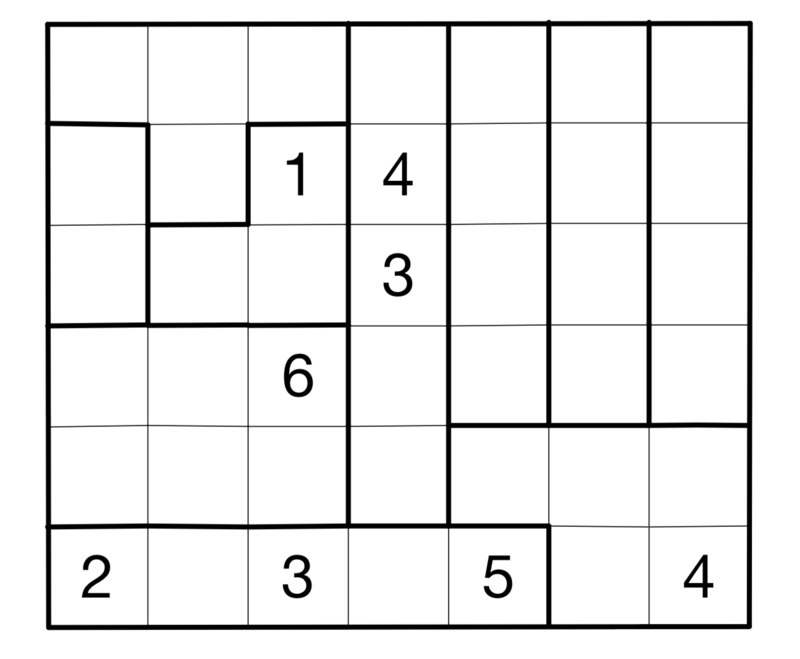 If the area has two squares, like the one bottom left below, then it must be filled with the numbers 1 and 2. No number can be next to the same number in any direction, whether horizontally, vertically or diagonally. So in the grid below, the fact that there is a 4 on the side means there cannot be a 4 in any of the 5 squares surrounding it. Here is an example with its solution and then a larger cut block puzzle to try. Solve the following Cut Block Puzzle. Once finished, upload to www.bournetolearn.com or hand in to your teacher your solution along with your note. Homework 2 - Look for the something? Search for data or information happens everyday. Examples of search may include small task of find an item you just paid for from a receipt with all the items you just purchased to big task of police force searches for suspects from possibly millions of persons. To search an item from a receipt is easy for a human but search for a suspect from millions of others is much much harder for a human. There are many algorithms exist for search, some are better than others. If a list is short, we can quickly scan the list, either find or not find the item. But if the list if very long, what you do? we may need to scan the list one item after another from the beginning. Use pen and paper, word or this website to create a flowchart of your algorithm on how to search for any item from a list of any length. Look at the list given above, try to suggest a way to improve the efficiency of your search algorithm.